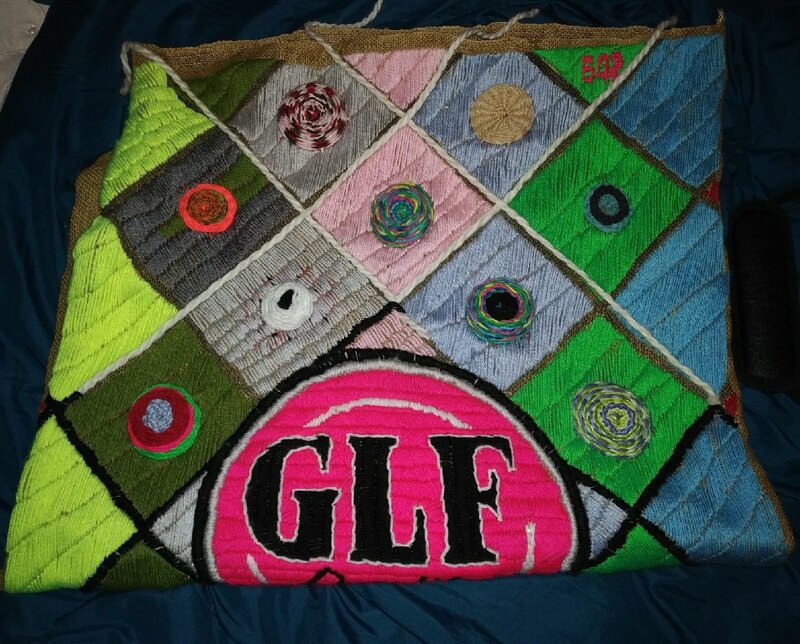 Yesterday, I resolved to finish the final stitchings for the GLF Quality burlap art project. Here’s what things looked like in the morning. Do you see those thick white strips of yarn? Those strips join other strips that are sewn into the burlap fabric with thinner black yarn. This gives the project nice raised edges, giving a faux patchwork quilt effect to the final project. But if I don’t get these things stitched up, I fear that procrastination will set in. And if I want to enter this artwork in competition this year, I need it finished sooner rather than later. Okay. Get the yarn and the needles. Let’s do this. Oh, and one more thing. I had to start the black yarn steps of this project at the base of the burlap sack and work up. That’s because as I sewed each strip of thick white yarn into the burlap, the yarn stretched out – if I cut a four-inch piece and started sewing, that four-inch piece could stretch to five inches or longer. So I had to work from one direction (the bottom) to the other direction (the top). So with a steady diet of Investigation Discovery and the National Geographic channels on as background noise (don’t give me guff, NatGeo was showing an Alaska State Troopers marathon, as cops stopped meth dealers, homebrew alcohol producers and crazed moose invasions), I charged through the project. Okay, I did take breaks when possible. Took the car for its New York State inspection. Can’t believe it’s been two years since this 2013 Chevrolet Cruze came into my life. Dracourage passed the inspection with flying colors. Aces. Back to stitching. Kinda running low on black yarn. Hope I can make it through without an emergency run to Jo-Ann Fabrics for another skein. I can now enter this in competition. Awesome. So that’s two burlap art projects completed. I have a third one that I’ve sorta started, but I’m not going to give a big reveal on that one until it’s complete. I kept everyone involved in this project only because I needed to stay motivated to finish it. I couldn’t just let it wither into a pattern of procrastination. That’s not how things are supposed to work. Okay. Ready for the next project. 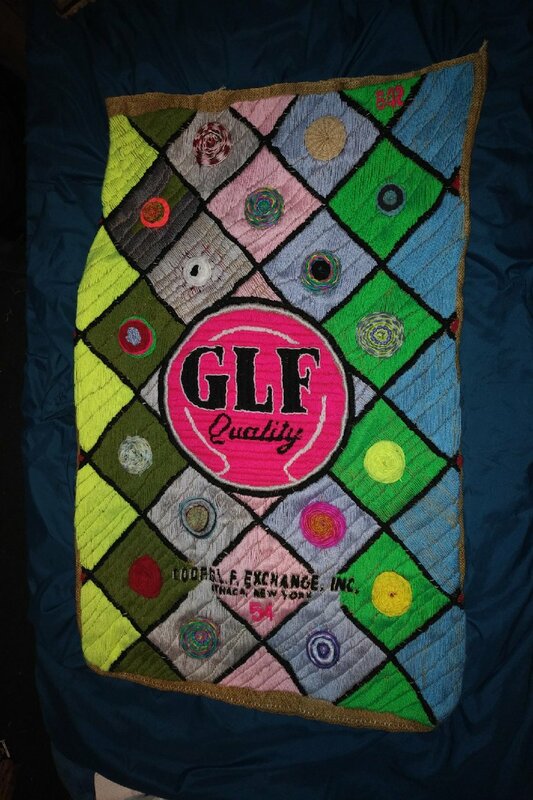 3 replies to The GLF Quality Project – completion! You’ve put this old embroider to shame! I’m so impressed! I’m anxious to hear how it does in competition. Procrastination is my middle name!